If you get a raise and move up a tax bracket, do you actually lose money? 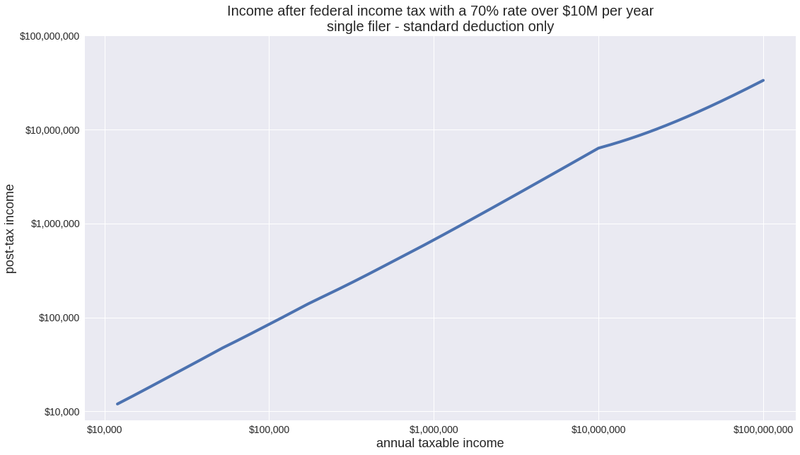 Does a 70% tax rate on the highest earners mean that you'll lose 70% of your income to taxes? You can find tax brackets easily online. Here's a link. The rate per additional dollar earned in each bracket is its 'marginal tax rate'. How do you convert that into actual lost income or an actual effective tax rate? What if we added another bracket with a marginal rate of 70% for incomes greater than $10 million? Notice how as you move to the right, the post-tax income always goes up? The rate that it increases changes, but your post-tax income never goes down. You don't lose any money by moving up a bracket with a tax setup like this. You might earn too much for certain benefits and that can be a problem, but that's not related to the marginal tax rate. 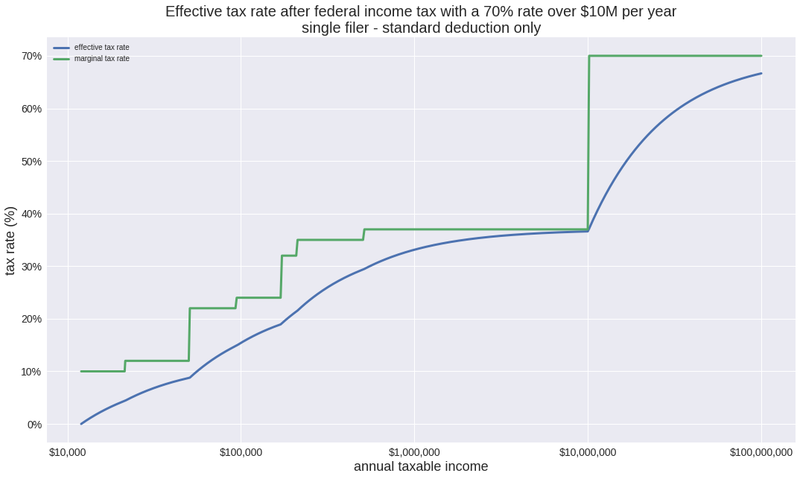 Notice how the effective tax rate is never quite as high as the marginal tax rate? If you're in the 32% bracket, you don't actually lose 32% of your income to federal tax. In reality, you'll pay lower federal rates than this. There are other deductions and tax credits. Capital gains and dividends are also taxed at lower rates. 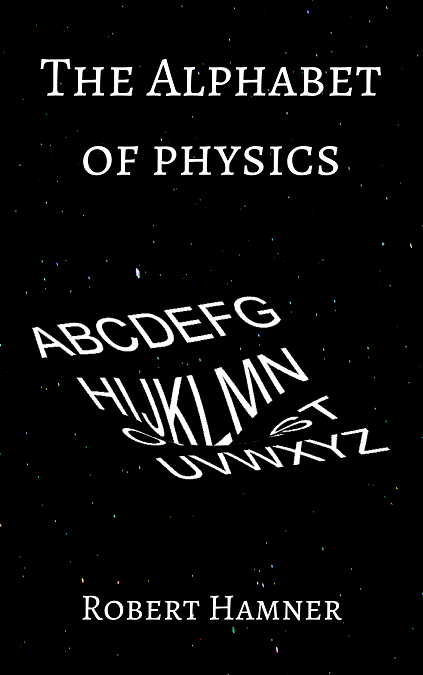 That doesn't change the general idea though. Whatever your marginal rate is, your effective federal tax rate will always be below it, and will often be way below it. Hopefully this clears up any misconceptions you might have heard similar to the opening questions. If any remain, just let me know in the comments. In the first chart annual taxable income vs. post-tax income, having a 1:1 aspect ratio chart could be insightful too.